It looks much more yellow here than in the box! The thread I used (Sulky rayon machine embroidery) is that awful bronzey yellowy green that shows up before spring really gets started. It does not show up so well in the deeper texture of the machine needle felted fabric. I'll try using some heavier thread on the next one. I do have a layer of iron-on stabilizer on the back because without it the stitches go right through the felt. I wonder, too, what I really need for a base layer. I was told to use basic craft felt for most work. I don't like the looks of that, and I can make huge amounts of topography in it by overworking particular areas. I have some wool jersey that I felted (on purpose!) that is a little heavier. I could try not using anything, and letting the wool felt to itself. 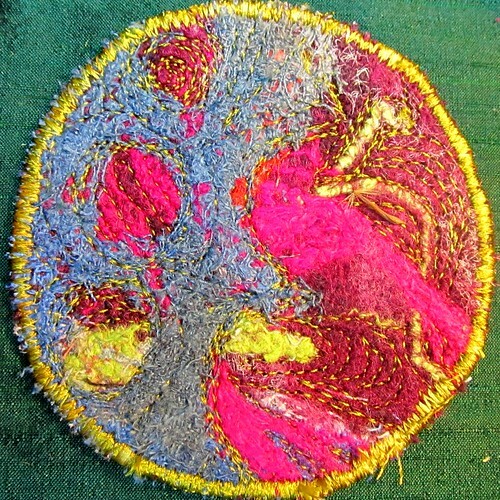 Wet felting relies on the wool felting to itself, and containing any non-felting inclusions. I don't know if dry felting does that. So, I have some experiments to try. I like Alice just hanging out on my back, holding Aerin's foot.